TV show Sydney Weekender loves sharing the best things to do in NSW and, last week, revealed the secrets of Royal National Park. 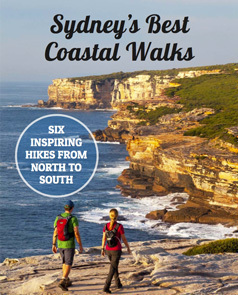 Sydney Coast Walks has been guiding walks along Royal's stunning coastline for nearly four years so we were delighted to share our favourite places during a full day walk along the Coastal Walk with the reporter and crew from Sydney Weekender. On all of our walks, you learn about the nature and cultural heritage of the Park as you walk, leaving you with a rich understanding of the environment and a greater appreciation of those who have walked here before you. It was the annual whale migration season when Sydney Weekender came out with us, so it was wonderful to spot a mum and calf gliding through the water below our magnificent clifftop viewpoint. TV presenter Mel Symons with the Sydney Weekender crew. Tagged In the media, Royal National Park.